Leaving behind the hyperkinetic time-lapse photography and vivid colors of their “Qatsi” trilogy (KOYAANISQATSI: LIFE OUT OF BALANCE, POWAQQATSI: LIFE IN TRANSFORMATION, and NAQOYQATSI: LIFE AS WAR) director Godfrey Reggio and composer Phillip Glass go to the opposite extreme for their latest sort of documentary collaboration, VISITORS. While Glass' score is typically minimalistic and hypnotic, the imagery here is in crisp, glossy black and white and composed mostly of long, static takes of human faces, with the occasional bit of architecture thrown in for variety every now and then. Perhaps the reason for such a drastic shift in pacing and style is due to the absence of “Qatsi” cinematographer Ron Fricke, who has gone on to direct a number of films on his own (BARAKA, SAMSARA, etc. ), or perhaps it was a considered choice just to do something different. Either way, the resulting film never really connects on the kind of emotional/spiritual level it seems to be aiming for. Whatever the intent or message of VISITORS, it eluded this viewer. Even if one does “get it”, an hour and a half series of mostly still images isn't most people's idea of compelling cinema. 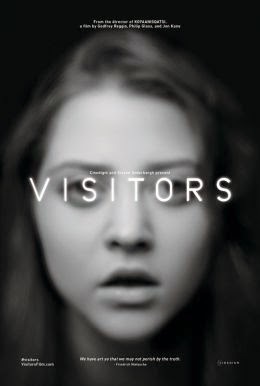 None of which is to say that VISITORS is a “bad” movie. On a technical level it's very well made, and the imagery is undeniably striking. I have no doubt that there are viewers out there for whom this material will resonate, and I hope there's enough information in this review for readers to gauge if this might be more up their alley than mine. Personally, though, I found the film painfully dull and would much rather have listened to the Glass soundtrack with the lights out so I could make up my own images in my mind. 2 out of 4 stars.